The NCSA Blue Waters project, in collaboration with the National Computational Science Institute (NCSI) and national HPC programs, is launching a coordinated effort to prepare current and future generations of students with the computational thinking skills, knowledge and commitment to advance scientific computing through the use of high performance computing (HPC) resources and environments. Petascale computing is more complex than previous computing paradigms. New approaches for teaching and learning are required, and no single educational institution has the expertise and experience needed to fully exploit this extraordinary capability. Preparation for petascale computing requires solid grounding in Computational Science and Engineering (CSE), HPC and HPC-related curricula. As a community, we must address the engagement of a larger and more diverse workforce to broaden participation and to ensure that CSE education keeps pace with the evolution of science and technology. We will leverage faculty expertise to establish best practices, identify and fill gaps, and modernize the CSE curriculum across all science, technology, engineering and mathematics (STEM) fields. The goal is to engage undergraduate students in petascale computing research and education projects. Students selected through an application process will be provided with a full-year internship that includes summer and academic year support totaling $5,000. The students will become members of a petascale research group. The students will work within a research or education team, and will be provided multiple opportunities to interact with all of the other students during their internships. The NSF Blue Water Project will be funding 17 undergraduate research internships this year. This program provides for a $5,000 stipend for the student over the course of the year, travel, accommodations, meals and participation in a two week intensive Petascale Institute at the National Centre for Supercomputing Applications (NCSA) and also travel to the SC11 conference in Seattle in November. Students must be enrolled in an undergraduate institution. Students at all undergraduate institutions, as described above, are encouraged to apply. Under-represented students are strongly encouraged to apply. The NCSA Blue Waters project, in collaboration with the National Computational Science Institute (NCSI) and national HPC programs, is launching a coordinated effort to prepare current and future generations of students with the computational thinking skills, knowledge and commitment to advance scientific computing through the use of high performance computing (HPC) resources and environments. Preparation for petascale computing requires solid grounding in Computational Science and Engineering (CSE), HPC and HPC-related curricula. As a community, we must address the engagement of a larger and more diverse workforce to broaden participation and to ensure that CSE education keeps pace with the evolution of science and technology. We will leverage faculty expertise to establish best practices, identify and fill gaps, and modernize the CSE curriculum across all science, technology, engineering and mathematics (STEM) fields. The goal is to engage undergraduate students in petascale computing research and education projects. Students selected through an application process will be provided with a full-year internship that includes summer and academic year support totaling $5,000. The students will become members of a petascale research group. The students will work within a research or education team, and will be provided multiple opportunities to interact with all of the other students during their internships. The NSF Blue Water Project will be funding 17 undergraduate research internships this year. 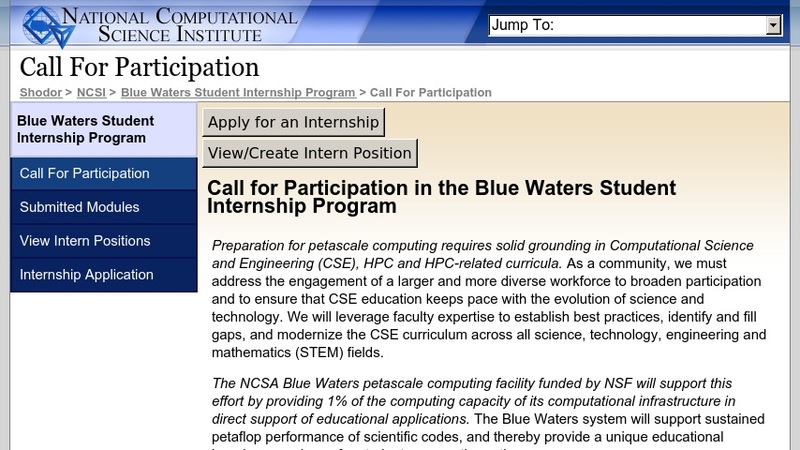 This program provides for a $5,000 stipend for the student over the course of the year, travel, accommodations, meals and participation in a two week intensive Petascale Institute at the National Centre for Supercomputing Applications (NCSA) and also travel to the SC11 conference in Seattle in November. Students must be enrolled in an undergraduate institution. Students at all undergraduate institutions, as described above, are encouraged to apply. Under-represented students are strongly encouraged to apply.